When you join a Scout Troop, you must first complete all the requirements for Troop Membership before being invested as a Scout. Those who hold the Link Badge have already completed these requirements. 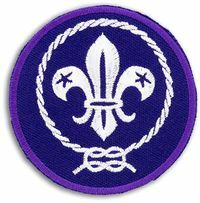 Repeat from memory the Scout Promise and Scout Law and, in accordance with your age, explain their meaning and how to carry them out. Show a general knowledge of the life of the Founder, Lord Baden-Powell of Gilwell, and the spread of Scouting world-wide. Show an understanding of your rights and responsibilities as a child, and when to say “no”. Notes: These requirements must be completed with the Troop Scouter as soon as possible and preferably within three weeks of your joining the Scout Troop. Once you have completed all of these, you are ready for a special ceremony where you will be invested as a Scout and become a member of the worldwide Scout movement by making your Scout Promise. This page was last modified on 7 March 2019, at 08:11.